He became a millionaire overnight but more than a decade later all the money is gone and his family is in tatters. To most it may sound like the ultimate dream: A R5 Lotto ticket changing an old man's life in a heartbeat with winnings of R6m. Mkhatshane George Manganyi was overjoyed at first. At last, an end to a life of struggle, he thought. He had won R3 000 in the Lotto before, but never in his wildest dreams thought he would become a millionaire. 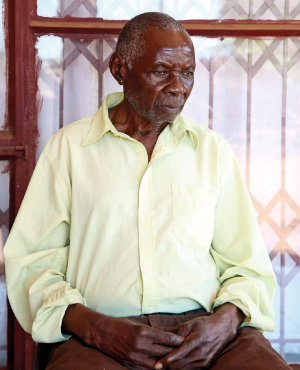 He had visions of building a mansion for himself and his wife, Maria Manganyi, bigger than anything their village of Malamulele in Limpopo had ever seen. He dreamt of driving the most luxurious cars available and owning acres of land where he could farm cattle and sheep and plant fruits and vegetables. But that dream is long gone now. Mkhatshane (85), who struck Lotto gold in 2006, is poorer than ever and he and his wife claim their win has been a curse. The frail old man puts his head in his hands, defeated by a tragic series of events that ruined what should have been the couple's golden years. "We don't have a cent to our name," Maria (72) says. "We survive on grant money," Mkhatshane adds. "I have nothing to show for the money I won..."
The millions destroyed their family, he says. "We have no peace. None of my children get along and one of my sons was shot dead. I have nothing to show for the money I won." The money is all gone, vanished from their bank account. According to newspaper reports, one of the couple's sons, Mzamani, an ex-cop, was convicted of defrauding them of millions. But Mzamani claims his murdered brother, Samuel, was behind the theft. Whatever the truth, Maria has made her peace. "We just thank God we're alive today to tell the tale," she says. It's a scorching hot Sunday morning in Malamulele and Mkhatshane and Maria sit in the shade of their veranda. Many of the homes in the village are mud huts, but their house is partially renovated with an unpainted grey security wall. It's a modest home for a couple who were millionaires a few years ago. Maria is seated on the tiled floor beside her husband of 49 years. Despite all, they have endured they remain a loving couple, which is evident as they tell us their tragic tale. When Mkhatshane won R6 113 744 in 2006 he invested R4m with ABSA and used the rest to renovate his house and buy a Mitsubishi Pajero, a Colt bakkie, a Mercedes-Benz and two tractors. He no longer owns any of the cars. Maria claps her hands and says their winnings "just magically disappeared from the bank account". Mkhatshane suspects Mzamani (53) and says he won't rest until he gets his money back. "All we have left are these two second-hand tractors that don't even work anymore," he says, pointing at two old rust buckets in the backyard.